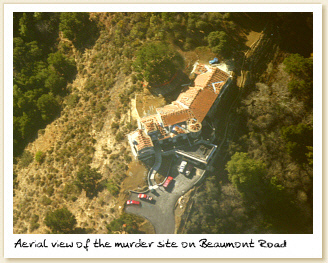 9561 Beaumont Road, nestled in the hills above Los Angeles, is the site of perhaps the most shocking and gruesome murder rampage in the history of that fabled city. The date was July 29, 1969. In a time marked by protests for peace and free love, this fateful night would forever scar the City of Angels, as four of Hollywood’s most elite and visible personalities were savagely mutilated in their sleep. Authorities would remain baffled for decades as they searched for clues and motives behind the heinous crimes on Beaumont Road. The horrible crimes still remain as one of Hollywood’s greatest unsolved mysteries. To this day one piece of hard evidence exists as a historic relic to the terrible tragedy that took the lives of four beloved public figures. None of the more recent developments in forensic science have allowed for any breaks in the case, and as the file has remained opened on the DeWitt murder spree, modern day detectives still attempt to piece together the unsolved events of that night. This site is a testament to the events of that night and to the memory of the four beautiful lives that were lost at the hands of a dangerous culprit that remains at large. To learn more about this film, please visit www.houseattheendofthedrive.com for complete information.